A few weekends ago, I ran out of my traditional laundry soap. I used to use the liquid sunlight soap. I've been waiting for this last jug to run out for a long time now as I've been dying to try and make my own laundry soap. Money is and has been tight, so I've been trying to save some wherever I can. 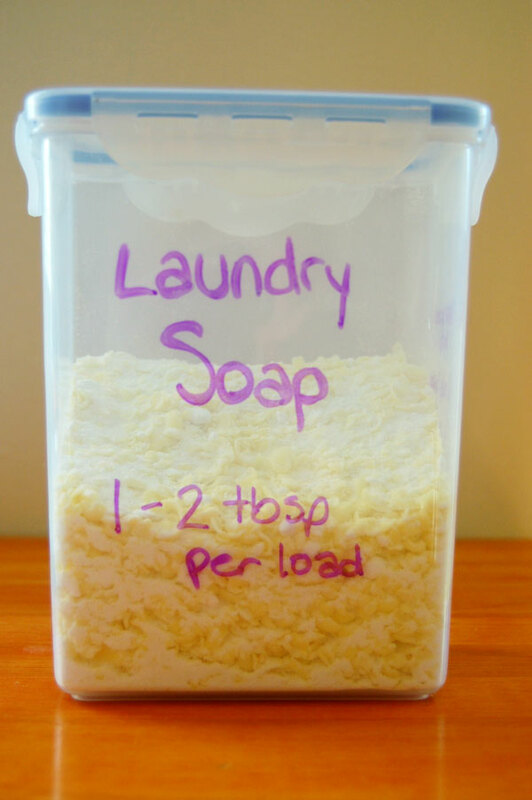 I saw that if you make your own laundry soap, the cost per load is $0.05 vs Tide, which is $0.21. Sunlight is cheaper than Tide, but what beats $0.05 a load??? I used my "tool" - a box grater and grated my bar of soap. It smelled so nice and lemony. Put my soap in a mixing bowl with the borax and washing soda, sealed the lid on and shook it like mad, making sure its all mixed together. Each load of laundry uses a tbsp of Laundry soap, maybe 2 if its extra dirty. I'm very happy with the results, everything gets clean, and smells great. So far my little ones with their sensitive skin have not had any bad reaction to anything. I think I'm going with this stuff for a while. Thanks for sharing! I would love to save money on laundry soap!